Dave Stewart, who co-wrote the score to the musical Ghost, and his Eurythmics partner Annie Lennox are among the nominees for the 2013 Songwriters Hall of Fame, according to The Associated Press. The gala will takes place on June 13 at the New York Marriott Marquis. 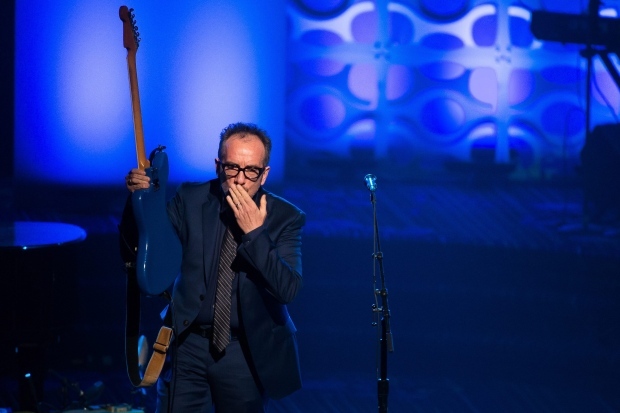 Other eligible singer-songwriters are Elvis Costello, B.B. King, Ray Davies, Jimmy Buffett, Vince Gill, Rod Temperton, Fleetwood Mac's Stevie Nicks, Lindsey Buckingham and Christine McVie, Jeff Lynne, Steve Winwood, Aeromsith's Steven Tyler and Joe Perry, Bobby Womack, and Foreigner's Lou Gramm and Mick Jones. Last edited by sweetest punch on Wed Mar 02, 2016 1:05 pm, edited 2 times in total. Elvis won't be inducted into the Songwriters Hall of Fame 2015. Cyndi Lauper, Toby Keith and Grateful Dead's Jerry Garcia will be inducted into the Songwriters Hall of Fame in June. The organization announced Wednesday that Linda Perry, country music songwriter Bobby Braddock and "Hoochie Coochie Man" writer Willie Dixon will also be inducted on June 18. Garcia and lyricist Robert Hunter will be inducted as a duo for their songwriting work for Grateful Dead. Perry has written hits such as Christina Aguilera's "Beautiful" as well as songs for Pink and Alicia Keys. The hall's 46th Annual Induction and Awards Dinner will take place at the Marriott Marquis in New York City. Garcia and Dixon will be inducted posthumously. Tom Petty, Vince Gill, Elvis Costello and Kenneth "Babyface" Edmonds were part of the acts considered for induction this year. The minds and hearts behind such songs as “What’s Going On,” “Radio Radio” and “Free Fallin’” will be honored this year by the Songwriters Hall of Fame, whose 2016 induction class includes Marvin Gaye, Elvis Costello, Tom Petty and Chip Taylor (“Wild Thing”), and Nile Rodgers and Bernard Edwards of Chic. The 47th annual induction ceremony will take place at the Marriott Marquis in New York on June 9. Kenneth Gamble and Leon Huff, the songwriters who now serve as co-chairmen for the organization, called the group “a beautiful mosaic of the best of late-20th-century popular music,” including rock ’n’ roll, soul, R&B, funk and dance. “With the exception of two, all of the 2016 inductees are alive and continue to be as vitally creative as ever,” they added in a statement. The hall was founded in 1969 and counts about 400 honorees. Last year’s class included Linda Perry, Cyndi Lauper and the Grateful Dead’s Jerry Garcia and Robert Hunter. That's pretty esteemed company that Elvis will be keeping. Took a quick look at past inductees, jeez I don't know even half of the names. That's on me, I'm sure many of these folks were good. However, for the names I do know, they sure seem to take longer than expected to get in. Bowie not until 2005? Marley not until 2010? EC not until now!?! Weak!!! And just because a group is popular and had some hits does not make them worthy IMO... Aerosmith, Foreigner.... really? I think they skew toward non-performing songwriters, hence the many unfamiliar names, but, yeah, I noticed some real cheezballs in there. Six blocks away until 3:00 p.m. but not feeling like it's worth the walk so early. Hope Elvis enjoys a night well deserved. Songwriters Hall Of Fame, via Twitter. Speech & performance of Alison. Introduction by Marcus Mumford. Great photo of Elvis and Diana looking happy together - good on yer ! Costello called himself “the least commercially successful songwriter you have ever inducted” and wondered “how in the world did I end up with my photo next to Marvin Gaye” in the event’s program book. He thanked Linda Ronstadt and her producer/manager Peter Asher for recording “Alison” in 1978, generating royalties that “kept the gas in my tour bus” as he made his case before audiences across the United States. He also recalled being third on a bill for a club show with Petty in Chicago, and hiding behind a plastic plant with Rodgers on the stage of a Dutch music TV show. 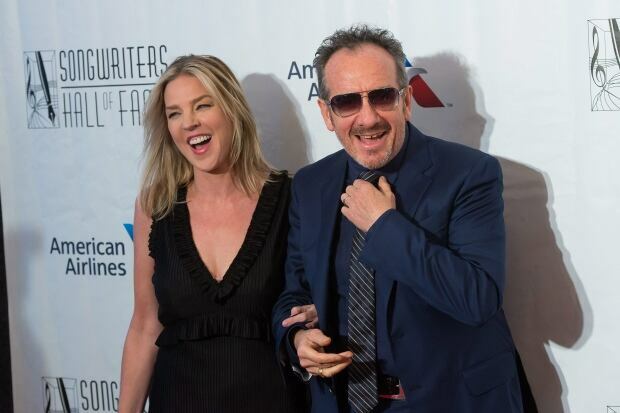 He concluded by thanking his wife, singer Diana Krall -- “I will never be a good enough songwriter to tell her how much I love her” – before picking up his blue Fender to perform “Alison. Congratulations to EC. It's about time. What a cute photo of the happy couple. I also liked that Sister Sledge was one of the performers. We Are Family - classic tune from a Philadelphia family. Sweet.